The MacDonough family had a blast on their recent Gloucester striped bass charter aboard Tuna Hunter Fishing Charters. Alexis and Hunter teamed up for this striped bass – learning the entire process from catching live bait to baiting, hooking and fighting the fish along the way. This trips was mainly offshore 1 to 2 miles, aiming ofr larger stripers that hang out off the Gloucester, Cape Ann coast. This type of striped bass charter is an alternative to striper charters that hugs the rocky coast along Kettle Island, Norman’s Woe, Mussel Point, Milk Island, Thatcher Island and beyond. Tuna Hunter knows the coast and the latest conditions, to adapt your charter to produce the best catch. Tuna Hunter still has openings for full and half-day striped bass fishing, or full day bluefin tuna or cod and haddock fishing charters. 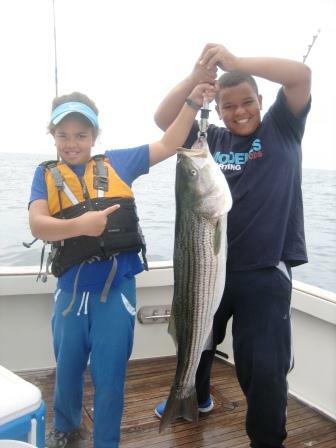 Give us a call 978-407-1351 or email captain@tunahunter.com for your family fishing charter.